I think i just got played. David O’ Russell was shooting for his hat trick with ‘American Hustle’. In 2010, we got “The Fighter,” an amazingly emotional story about loss and addiction. 2012 brought us “Silver Linings Playbook,” an incredibly off beat comedy littered with lovable yet slightly bizarre characters and a different take on a familiar plot. Both of these films were highly praised and proved that Russell is one of today’s more impressive directors. “Hustle” is evidently getting the same reception, but I for one cannot understand for the life of me why. It’s a simple yet convoluted story about con men that end up working for the government to try to con criminals and everyone is always getting conned everywhere left and right. Each character has an agenda and they love conning and you’re not supposed to be able to tell which way it’s supposed to turn but everyone wants to hustle everyone. That’s the basic gist of the whole film. Did I mention that is’ about con artists hustling people? I swear, it felt like i was just getting slapped in the face with another useless con every 5 minutes. Russell brings back all his favorite actors to work with, Christian Bale, Amy Adams, Jennifer Lawrence, Bradley Cooper, Robert De Niro; and who I believe is a first time Russell cohort, Jeremy Renner (who might actually give the best performance out of the whole lot). Each and every one of them are wonderful in their respective roles; but their roles felt reduced to little more than caricatures of stereotypes. Everyone has an exaggerated accent, which is becoming a hallmark of Russell films. Even then, the performances were entertaining to say the least. The sets, costumes, music, cinematography; all all meticulously cared for to bring the viewer into the 1970’s and allow the characters to thrive in this setting. HOWEVER, the plot was incredibly weak. It’s full of predictable twists and turns. It’s a very sophomoric attempt at a crime plot. I mean, you can turn down the volume and tell who is hustling who from the get go. And of course, one would expect that with so many self interested characters, this would lead to a crazy awesome complicated climax. But in the end, I just felt like my hand was held for two hours through the simplest maze ever. 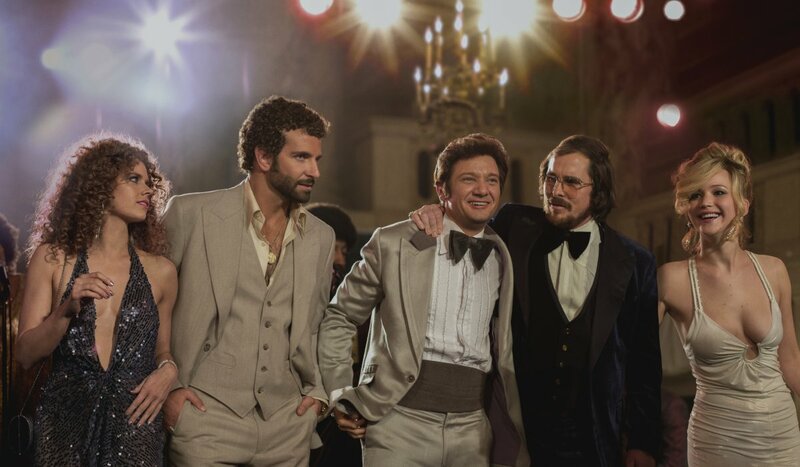 Maybe the whole point of ‘American Hustle‘ is to con America and the critics. Everyone is loving this film, and though I admit that it has its sporadic great moments, it can’t escape the fact that it has no depth whatsoever. But I guess with a good director, some star actors, and a solid track records, critics will believe what they want to believe. So, well played Russell, well played. You will make a fortune and probably win a few awards for taking what should have been a thirty minute TV script, dolling it up, and stretching it out for over two hours. You have officially hustled America. Bryan’s Film Review: ‘American Hustle’!! Film Review #2: ‘The Arrival’! This entry was posted on Friday, December 20th, 2013 at 11:02 am	and is filed under Film, News. You can follow any responses to this entry through the RSS 2.0 feed. You can skip to the end and leave a response. Pinging is currently not allowed. « Fernando’s Film Review: ‘Inside Llewyn Davis’! !